You will only receive an email if there are notices in your area(s). You will be sent an email with a one-time PIN. Entering the PIN will log you in — no password required! Check your email for the PIN. Enter it below to log in. If you continue, all of your custom areas and notice preferences will be deleted, and your account will be deleted. There is no way to undo this. We'll miss you; if you decide to create an account again, we don't hold grudges. Oops! Something went wrong when saving the area you defined. Please try drawing it again. NoticeMe is a handy tool, but is not part of the City’s legal public notice requirements. NoticeMe was designed to supplement those other forms of notice, but not replace them. Click again to end and start a new segment. Draw the area where you wish to be notified. Double-click to finish your area. Tap again to end and start a new segment. Continue until you've defined the area where you wish to be notified. Double-tap to finish your area. You are about to delete an area. Are you sure you want to do this? As a part of the Neighborhood Participation Program, NoticeMe was developed to encourage citizen participation in issues pertaining to land-use. 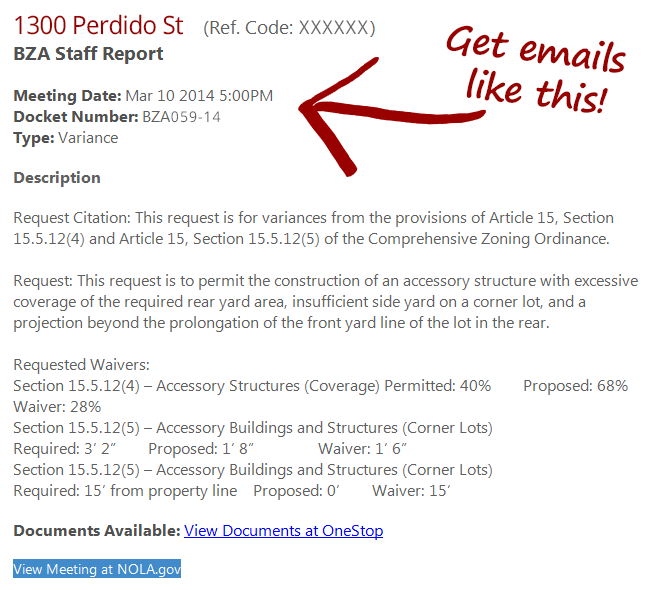 NoticeMe is a tool that allows you to sign up for email notifications for land-use changes in New Orleans. You can add as many areas of interest as you like and specify how often you would like to receive emails.